She noticed that his blood was puddled on the floor. I watched her put her right hand down on the hard wooden floor, wet with his blood, and then deliberately rub her hand around on the little, red puddle. She paused and then rubbed both hands together. She went to the drum and rubbed the blood off her hands and onto the drum skin. I went to see the Grandmother Drum for Peace event, with my wife, and a friend. Drum? An amazing drum it was. We are talking about a hypnotic sound ritual from a 7 foot diameter wooden drum that weighs hundreds of pounds, a true giant in the world of drums. The audience paid just inside the door. The cashiers at the door wrapped a yellow tyvek band around the wrist of each person that paid. Once inside the attendees walked to the far side of the gymnasium, in the corner near the wall with the Jaguar symbol.. The event took place in a corner of the gym, using only one set of seats, and about one quarter of the floor space. The tone was calm. Many people in the audience brought a drum or two with them. Some people bought drums from a table near the entrance. It was a very relaxed scene, lots of children and grandmothers, and some men, in a mostly feminine audience of about 150 people. Definitely a family-and-friends type of audience. People were passing around rattles, brightly colored plastic eggs containing garden seeds and dried corn. Children were shaking them, experimenting with the sounds. There had been advertising on a local radio station, WATD-FM. Some internet publicity preceded the event also. 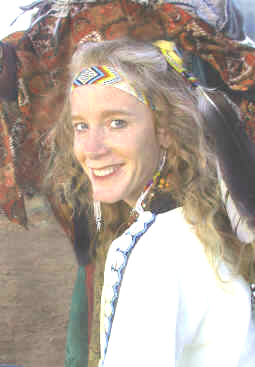 On a web page at youtube.com, I discovered this information: “White Eagle Medicine Woman (Suraj Holzwarth) is the director and Drum Keeper of the International GrandMother Drum Peace Project. She is an international renowned shaman, seer and performance artist of Seneca and Celtic descent. Her CDs include Journey of the Heart and songlines of the Soul. She is the director and co-producer of the newly released documentary film Grandmother Drum: Awakening the Global Heart. 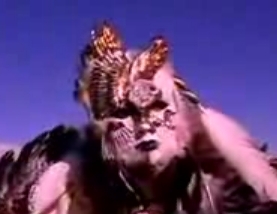 She is also the founder and director of The Whirling Rainbow Foundation and the Rainbow Fire Dream Institute in Palmer, Alaska.” She performed in a beautiful white costume, and, in one part of the prayerperformance, posed in a beautiful, white eagle mask. She was accompanied by a young woman who sang, and also danced. The name of the dancer/singer was announced, but I didn’t write it down, so I’m unable to report that. I do have some pictures in my cell phone, which are low quality shot from the top bleacher seat. There were at least two photographers at the event with good cameras. Everything was spiritual and calm, people singing, kids shaking plastic rattles, the picture of peace and harmony – until the end of the intermission. I was standing about 8 feet from the Grandmother Peace Drum on the opposite side from White Eagle Medicine Woman. I was in the “rattle” section, holding 2 maracas that my friend brought. Between my position and Suraj Holzwarth stood the massive drum, with corn meal sprinkled on it, and also scattered on the floor. When she started talking again, she was interrupted by a group of 6 young people, who had marched quickly into the middle of the floor next to the drum, confronted her, and started shouting. Events happened fast so I’m not sure of the precision of my memory; there were 3 men and 3 women. I guessed their ages as between 20 and 40, certainly younger than most of the adults in the room. They claimed to be Wampanoag, and their leader, the foremost of them, demanded to know who gave this lady (self-admittedly only a part-blood Seneca) permission to be here? And they were angry, shouting because they were offended by this “mockery of their sacred rituals.” They specifically didn’t like the sale of tickets to a Sacred Ritual. He shouted, “What if someone was making a mockery of a Christian ceremony?” Bam! The leader of the Wampanoag protesters had marched in carrying a substantial, thick, walking stick; to emphasize each of his points, he began slamming the stick down onto the gymnasium floor. Bam! Bam! Bam! White Eagle Medicine Woman had a bigger ceremonial stick, with a black rubber cap at the bottom, but she was not using it. However, he used his with enthusiasm. “Who gave you permission to be here and do this?” Bam! Men in the audience started moving inward, towards the action; women and kids began backing up, moving away, their faces showing that they were uncomfortable. Most of the really young children were oblivious, not understanding the confrontation. A few children, however, were grasping it and responding fearfully. Meanwhile, White Eagle Medicine Woman was not escalating, acting reasonably, plainly wanting them to sit down and talk. Her walk-in opponents, however, didn’t want any of that reasonable stuff. A bunch of people standing around became frightened and frustrated, so they start banging furiously on drums and shaking the rattles that they brought, originally intending to drum for peace. That hope was abandoned; they were drumming to drown out the shouting and the angry words. The volume level went through the roof. The only cop on duty was a middle-aged woman, about 64 inches tall by my estimate. At the explosion of shouting and drumming, she came running out of the back room where she’d been hanging out with someone. If she had been at the front entrance, perhaps this story would be different. She ran directly to the young men and got in their faces, which provoked an immediate, further escalation of shouting and waving of arms. I could see that the leader of the Wampanoag protesters had veins standing out on his temples. He was visibly enraged. The guy behind him wore a tee-shirt, with the arms torn off, and the words “Homeland Security” silk-screened in large letters on the chest. That was a wry comment on current American politics, viewed through the eyes of a Native American. The male protesters were not in ceremonial clothing. They were in street clothes. The cop and the chief protester were suddenly engaged physically, when he decided to try to destroy the 7 foot wide buffalo skin drum head. Whack, whack, whack! He gave 3 hard strikes with the stick he carried. Suddenly, the policewoman and he were wrestling, shoving, grappling. They came around the drum towards me, with him putting a head lock on her. Then their positions were reversed, she was attacking him. Nearby men were reaching in, to impede her opponent. I saw that she had a device in her right hand, not a gun. They were struggling right in front of me, literally three or four feet away. I could see them clearly. He turned and saw the pepper spray device aimed at him and he put out his left arm to stop it. Her hand with the pepper spray in it wobbled around in a circle, spraying people standing close by. Suddenly, I was tasting pepper, my lips were burning and I exhaled hard, instinctively, to keep that stuff out of my lungs. I backed up, putting my hands up in front of me. At that point the protester was down but kicking. Men were grabbing him. I saw her right hand come around and spray directly at his face from above. He twisted his head avoiding it, but most of the liquid hit him on the cheek and neck. I saw it glistening, dripping on his skin. I stepped further back, moving away from the biting smell, looking around for my wife. I began thinking about how we could leave the building safely after this nasty turn of events. Having stepped back, looking for the exit, I saw that some policemen had run into the gymnasium. They had Mr. Homeland Security face down on the floor between the drum and the left-most exit door. The young Wampanoag women were shouting at those policemen. The women protesters were not striking out, only shouting. The police had physical control of the protesters at this point. White Eagle Medicine Woman came over to the spot on the gym floor near me where the policewoman had subdued her opponent. White Eagle Medicine Woman knelt down in front of him and tried to talk to him. There was a lot of noise, so I guess that very little communication, if any, happened. The police picked him up and started force walking him towards the exit doors. She noticed that his blood was on the floor. I watched her put her right hand down on the hard wooden floor, wet with his blood, and then deliberately rub her right hand around on the little red puddle. Then she paused and rubbed both hands together. She went to the drum and rubbed the blood off her hands and onto the drum skin. Her actions were eerily calm, slow and deliberate, in great contrast to the commotion and noise around us. She was not speaking. The police woman got everyone’s attention by shouting loudly, no microphone needed. She said that if there was anyone here in the gym that was unwelcome, they should leave now. Her emphasis plainly said that greater police response would have been forthcoming against anyone silly enough to take violent actions. My wife and I walked over to the far left corner where my friend was standing with the PA sound man, Ken. We talked a little bit about leaving. Before we could get it together to do that, everyone in the audience was making a big circle on the floor, holding hands. The drum was then surrounded, in the center of a fifty foot wide circle of about one hundred silent people, both adults and children. White Eagle Medicine Woman started talking, using the melee as a teaching opportunity. I found myself disagreeing with some of what she said, but everyone in the gym was listening intently. She said that we were witnessing the pain of the Wampanoag, and that it’s not about us. They – Indians – don’t hate us. But the turn of events showed how deep is the suffering of the Native Americans, especially those that are looking backwards “seven generations.” She said that the night’s events were about them expressing pain and frustration that had its roots in the horrible history that American Indians endured. She said that she had been challenged before, more than once, by medicine men and chiefs who don’t view her drum, and her rituals as authentic. She talked about being confronted by an aborigine fighter in Australia (I’m not making this up). She said that she had been “incested from age two to age five.” Because of that experience, she had been an angry person herself for a long time. She used to be a “flaming lesbian feminist” – her words. She said that we – all of us – must stop looking back at all the damage done historically. She said it is now time for all of us to recognize that we are all one people, and we need concentrate on Peace. She said the 1000 year period of peace that had been prophesied is starting now. She said we need to honor and support women and also make sure that no child is ever hurt. She says we’ve been breaking those 2 basic rules, causing much needless human suffering. Then, White Eagle Medicine Woman asked one of her “sisters” to talk, so Ken’s mike ended up in the hands of one of the other Indian ladies that had been there all night. She talked a lot, making a sort of weak apology for the behavior of the protesters (now long gone, having all been removed by the police team). She asked us to view the protestor’s behavior in the context of their life experience. I found myself listening without sympathy. My lips were stinging; the skin above my lips was stinging. I left and went into the men’s room and attempted to wash my face with soap and water. Unfortunately, that did not work. The stinging sensation spread around my mouth. What I didn’t realize was that the pepper spray was on the skin of my right hand and I’d been smearing it around on my face. Yuck. When we got home, all my clothes had to go in the washing machine. They smelled like pepper spray. I showered and washed up thoroughly. Then my wife noticed that she had a bruise in the corner of her left eye, and it was puffy. It did not progress, but we were somewhat worried. We speculated that she may have been struck by a small chunk of wood flying away from the clubbing of the drum. The three of us had a lively discussion on the way home. That’s a separate story for another day.